Source: CICH tabled created using data adapted from OECD. Greenhouse gas emissions by source. 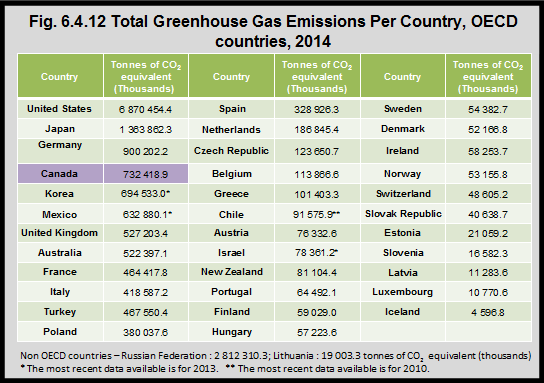 http://www.oecd-ilibrary.org/environment/data/oecd-environment-statistics/greenhouse-gas-emissions_data-00594-en?isPartOf=/content/datacollection/env-data-en – accessed February 15, 2017. According to the Organisation for Economic Co-operation and Development (OECD), in 2014, Canada had the fourth highest level of greenhouse gas emissions of 35 OECD countries.1 The United States had the highest greenhouse gas emissions and Iceland had the lowest emissions. 2Government of Canada. Canada’s Sixth National Report on Climate Change. 2014. http://publications.gc.ca/site/eng/456520/publication.html-accessed July 2017.